"Binormal" redirects here. For the category-theoretic meaning of this word, see normal morphism. In differential geometry, the Frenet–Serret formulas describe the kinematic properties of a particle moving along a continuous, differentiable curve in three-dimensional Euclidean space ℝ3, or the geometric properties of the curve itself irrespective of any motion. More specifically, the formulas describe the derivatives of the so-called tangent, normal, and binormal unit vectors in terms of each other. The formulas are named after the two French mathematicians who independently discovered them: Jean Frédéric Frenet, in his thesis of 1847, and Joseph Alfred Serret in 1851. Vector notation and linear algebra currently used to write these formulas were not yet in use at the time of their discovery. T is the unit vector tangent to the curve, pointing in the direction of motion. N is the normal unit vector, the derivative of T with respect to the arclength parameter of the curve, divided by its length. B is the binormal unit vector, the cross product of T and N.
where d/ds is the derivative with respect to arclength, κ is the curvature, and τ is the torsion of the curve. The two scalars κ and τ effectively define the curvature and torsion of a space curve. The associated collection, T, N, B, κ, and τ, is called the Frenet–Serret apparatus. Intuitively, curvature measures the failure of a curve to be a straight line, while torsion measures the failure of a curve to be planar. will be in the direction N and the curvature describes the speed of rotation of the frame. Let r(t) be a curve in Euclidean space, representing the position vector of the particle as a function of time. The Frenet–Serret formulas apply to curves which are non-degenerate, which roughly means that they have nonzero curvature. More formally, in this situation the velocity vector r′(t) and the acceleration vector r′′(t) are required not to be proportional. Moreover, since we have assumed that r′ ≠ 0, it follows that s(t) is a strictly monotonically increasing function. Therefore, it is possible to solve for t as a function of s, and thus to write r(s) = r(t(s)). The curve is thus parametrized in a preferred manner by its arc length. The Frenet-Serret frame moving along a helix. The T is represented by the blue arrow, N is represented by the red vector while B is represented by the black vector. From equation (2) it follows, since T always has unit magnitude, that N (the change of T) is always perpendicular to T, since there is no change in length of T. From equation (3) it follows that B is always perpendicular to both T and N. Thus, the three unit vectors T, N, and B are all perpendicular to each other. The Frenet–Serret formulas were generalized to higher-dimensional Euclidean spaces by Camille Jordan in 1874. Suppose that r(s) is a smooth curve in Rn, and that the first n derivatives of r are linearly independent. The vectors in the Frenet–Serret frame are an orthonormal basis constructed by applying the Gram-Schmidt process to the vectors (r′(s), r′′(s), ..., r(n)(s)). The tangent and the normal vector at point s define the osculating plane at point r(s). which establishes the required skew-symmetry. The Frenet–Serret frame consisting of the tangent T, normal N, and binormal B collectively forms an orthonormal basis of 3-space. At each point of the curve, this attaches a frame of reference or rectilinear coordinate system (see image). The Frenet–Serret formulas admit a kinematic interpretation. Imagine that an observer moves along the curve in time, using the attached frame at each point as her coordinate system. The Frenet–Serret formulas mean that this coordinate system is constantly rotating as an observer moves along the curve. Hence, this coordinate system is always non-inertial. The angular momentum of the observer's coordinate system is proportional to the Darboux vector of the frame. A top whose axis is situated along the binormal is observed to rotate with angular speed κ. If the axis is along the tangent, it is observed to rotate with angular speed τ. Concretely, suppose that the observer carries an (inertial) top (or gyroscope) with him along the curve. If the axis of the top points along the tangent to the curve, then it will be observed to rotate about its axis with angular velocity -τ relative to the observer's non-inertial coordinate system. If, on the other hand, the axis of the top points in the binormal direction, then it is observed to rotate with angular velocity -κ. This is easily visualized in the case when the curvature is a positive constant and the torsion vanishes. The observer is then in uniform circular motion. If the top points in the direction of the binormal, then by conservation of angular momentum it must rotate in the opposite direction of the circular motion. In the limiting case when the curvature vanishes, the observer's normal precesses about the tangent vector, and similarly the top will rotate in the opposite direction of this precession. The general case is illustrated below. There are further illustrations on Wikimedia. Applications. The kinematics of the frame have many applications in the sciences. In the life sciences, particularly in models of microbial motion, considerations of the Frenet-Serret frame have been used to explain the mechanism by which a moving organism in a viscous medium changes its direction. In physics, the Frenet-Serret frame is useful when it is impossible or inconvenient to assign a natural coordinate system for a trajectory. Such is often the case, for instance, in relativity theory. Within this setting, Frenet-Serret frames have been used to model the precession of a gyroscope in a gravitational well. Example of a moving Frenet basis (T in blue, N in green, B in purple) along Viviani's curve. On the example of a torus knot, the tangent vector T, the normal vector N, and the binormal vector B, along with the curvature κ(s), and the torsion τ(s) are displayed. At the peaks of the torsion function the rotation of the Frenet-Serret frame (T,N,B) around the tangent vector is clearly visible. The kinematic significance of the curvature is best illustrated with plane curves (having constant torsion equal to zero). See the page on curvature of plane curves. Two helices (slinkies) in space. (a) A more compact helix with higher curvature and lower torsion. (b) A stretched out helix with slightly higher torsion but lower curvature. (0 ≤ t ≤ 2 π). remains constant if the slinky is vertically stretched out along its central axis. (Here 2πh is the height of a single twist of the slinky, and r the radius.) In particular, curvature and torsion are complementary in the sense that the torsion can be increased at the expense of curvature by stretching out the slinky. This is a parabola up to terms of order o(s2), whose curvature at 0 is equal to κ(0). which is a cuspidal cubic to order o(s3). which traces out the graph of a cubic polynomial to order o(s3). A ribbon defined by a curve of constant torsion and a highly oscillating curvature. The arc length parameterization of the curve was defined via integration of the Frenet-Serret equations. The Frenet–Serret apparatus allows one to define certain optimal ribbons and tubes centered around a curve. These have diverse applications in materials science and elasticity theory, as well as to computer graphics. In particular, the binormal B is a unit vector normal to the ribbon. Moreover, the ribbon is a ruled surface whose reguli are the line segments spanned by N. Thus each of the frame vectors T, N, and B can be visualized entirely in terms of the Frenet ribbon. This fact gives a general procedure for constructing any Frenet ribbon. Intuitively, one can cut out a curved ribbon from a flat piece of paper. Then by bending the ribbon out into space without tearing it, one produces a Frenet ribbon. In the simple case of the slinky, the ribbon is several turns of an annulus in the plane, and bending it up into space corresponds to stretching out the slinky. In classical Euclidean geometry, one is interested in studying the properties of figures in the plane which are invariant under congruence, so that if two figures are congruent then they must have the same properties. The Frenet-Serret apparatus presents the curvature and torsion as numerical invariants of a space curve. (Translation.) r(t) → r(t) + v, where v is a constant vector. (Rotation.) r(t) + v → M(r(t) + v), where M is the matrix of a rotation. The Frenet–Serret frame is particularly well-behaved with regard to Euclidean motions. First, since T, N, and B can all be given as successive derivatives of the parametrization of the curve, each of them is insensitive to the addition of a constant vector to r(t). Intuitively, the TNB frame attached to r(t) is the same as the TNB frame attached to the new curve r(t) + v.
since MMT = I for the matrix of a rotation. Hence the entries κ and τ of (dQ/ds)QT are invariants of the curve under Euclidean motions: if a Euclidean motion is applied to a curve, then the resulting curve has the same curvature and torsion. Moreover, using the Frenet–Serret frame, one can also prove the converse: any two curves having the same curvature and torsion functions must be congruent by a Euclidean motion. Roughly speaking, the Frenet–Serret formulas express the Darboux derivative of the TNB frame. If the Darboux derivatives of two frames are equal, then a version of the fundamental theorem of calculus asserts that the curves are congruent. In particular, the curvature and torsion are a complete set of invariants for a curve in three-dimensions. The formulas given above for T, N, and B depend on the curve being given in terms of the arclength parameter. This is a natural assumption in Euclidean geometry, because the arclength is a Euclidean invariant of the curve. In the terminology of physics, the arclength parametrization is a natural choice of gauge. However, it may be awkward to work with in practice. A number of other equivalent expressions are available. An alternative way to arrive at the same expressions is to take the first three derivatives of the curve r′(t), r′′(t), r′′′(t), and to apply the Gram-Schmidt process. 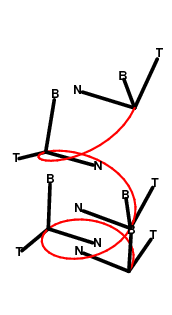 The resulting ordered orthonormal basis is precisely the TNB frame. This procedure also generalizes to produce Frenet frames in higher dimensions. If the curvature is always zero then the curve will be a straight line. Here the vectors N, B and the torsion are not well defined. If the torsion is always zero then the curve will lie in a plane. A helix has constant curvature and constant torsion. Given a curve contained on the x-y plane, its tangent vector T is also contained on that plane. Its binormal vector B can be naturally postulated to coincide with the normal to the plane (along the z axis). Finally, the curve normal can be found completing the right-handed system, N = B × T. This form is well-defined even when the curvature is zero; for example, the normal to a straight line on a plane will be perpendicular to the tangent, all co-planar. ^ Only the first n − 1 actually need to be linearly independent, as the final remaining frame vector en can be chosen as the unit vector orthogonal to the span of the others, such that the resulting frame is positively oriented. ^ This proof is likely due to Élie Cartan. See Griffiths (1974) where he gives the same proof, but using the Maurer-Cartan form. Our explicit description of the Maurer-Cartan form using matrices is standard. See, for instance, Spivak, Volume II, p. 37. A generalization of this proof to n dimensions is not difficult, but was omitted for the sake of exposition. Again, see Griffiths (1974) for details. ^ Iyer and Vishveshwara (1993). ^ Goriely et al. (2006). ^ For terminology, see Sternberg (1964). ^ For such an interpretation, see Rucker (1999). ^ Exploited by Rucker's construction of so-called kappatau curves. ^ Somewhat more accurately, the plane ribbon should be thought of as a "railroad track": one may move it up into space, but without shearing or bending its cross-ties. Frenet, F. (1847), Sur les courbes à double courbure (PDF), Thèse, Toulouse . Abstract in Journal de Mathématiques Pures et Appliquées 17, 1852. Goriely, A.; Robertson-Tessi, M.; Tabor, M.; Vandiver, R. (2006), "Elastic growth models", BIOMAT-2006 (PDF), Springer-Verlag, archived from the original (PDF) on 2006-12-29 . Griffiths, Phillip (1974), "On Cartan's method of Lie groups and moving frames as applied to uniqueness and existence questions in differential geometry", Duke Mathematical Journal, 41 (4): 775–814, doi:10.1215/S0012-7094-74-04180-5 . Serret, J. A. (1851), "Sur quelques formules relatives à la théorie des courbes à double courbure" (PDF), Journal de Mathématiques Pures et Appliquées, 16 . Spivak, Michael (1999), A Comprehensive Introduction to Differential Geometry (Volume Two), Publish or Perish, Inc. .
Struik, Dirk J. (1961), Lectures on Classical Differential Geometry, Reading, Mass: Addison-Wesley . Wikimedia Commons has media related to Graphical illustrations for curvature and torsion of curves.